Energy Forum Keynote Speakers Announced! Two champions for smart energy policy, FERC Chairman Jon Wellinghoff and Karen Harbert, President/CEO of the U.S. Chamber’s Energy Institute, will offer keynote presentations at the 2013 NECA Energy Forum on Oct. 12. Jon Wellinghoff was appointed Chairman of the Federal Energy Regulatory Commission (FERC) was by President Barack Obama in 2009 after serving as a FERC Commissioner since 2006. The independent agency oversees wholesale electric transactions and interstate electric transmission and gas transportation in the United States. Wellinghoff is an energy law specialist with more than 35 years of experience. Before joining FERC, he led a private law practice in Nevada, where he focused on cases pertaining to renewable energy and energy efficiency, causes he continues to promote as FERC Chairman. He was the primary author of Nevada’s Renewable Portfolio Standard (RPS), one of two state RPS programs to receive an “A” rating from the Union of Concerned Scientists. Wellinghoff’s priorities at FERC were the integration of renewable energy sources into the electric grid; the implementation of advanced technologies aimed at making the use and distribution of energy more efficient; and the promotion of demand-side energy practices, including real-time electricity pricing and the use of electric cars. These priorities emphasize improvements to the overall efficiency of the nation’s energy infrastructure. Wellinghoff has pursued his priorities through the implementation of regulatory practices that ensure a fair and competitive energy market, pointing out that it is through competitive energy markets that consumers will reap the full benefits of new technology. As Chairman he created FERC’s Office of Energy Policy and Innovation (OEPI), which is responsible for investigating and promoting new efficient technologies and practices in the energy sectors under FERC’s jurisdiction. Wellinghoff is co-chair of the Smart Response Collaborative launched jointly by FERC and the National Association of Regulatory Utility Commissioners (NARUC) and is a member of NARUC’s Committee on Energy Resources and the Environment. Although Wellinghoff submitted his resignation as FERC Chairman to President Obama on May 5, he will continue to serve in the post until a new chairman is appointed. As President and CEO for the U.S. Chapter of Commerce’s Institute for 21st Century Energy, Karen Alderman Harbert leads the Institute’s efforts to build support for meaningful energy action nationally and internationally through policy development, education, and advocacy. The Institute’s mission is to unify policymakers, regulators, business leaders, and the American public behind a common sense energy strategy to help keep our country secure, prosperous and clean. Under Harbert’s leadership, the Energy Institute has evolved into a premier national and increasingly international organization truly dedicated to advancing a constructive energy agenda and transforming the energy and environmental debate into a widely supported plan of action. Harbert frequently testifies in front of Congress and provides analysis to the media, policymakers and industry leaders. Harbert is the former assistant secretary for policy and international affairs at the U.S. Dept. of Energy (DOE). She was the primary policy advisor to the Secretary and to the department on domestic and international energy issues, including climate change, fossil, nuclear, and renewable energy and energy efficiency. Harbert was also a member of DOE’s Executive Board as well as the Credit Review Board. She negotiated and managed bilateral and multilateral agreements with other countries and international agencies to further the nation’s energy security and research and development objectives. In the private sector, Harbert worked for a developer of international infrastructure and power projects valued at more than $9 billion in countries in the Middle East, Asia, and Latin America. Harbert gained experience on issues associated with economic reform and privatization through earlier positions at the USAID, the Organization of American States, and the International Republican Institute. As our nation strives for energy independence and consumer demand for renewable power and energy conservation continues to rise, electrical contractors are constantly updating their expertise in green energy trends and technology. The NECA 2013 Energy Forum will bring electrical contractors together with leading policy-makers and industry leaders shaping the energy solutions market today. The speakers and panel discussions at the 2013 NECA Energy Forum are the best source for practical information about the trends, technology, and economic factors affecting the energy market today. Developers, engineers and building managers look to electrical contractors to provide solutions for their green energy goals. Discover the latest advances in emerging technologies, energy efficiency, renewables, energy storage, combined heat and power, and the projected abundance of natural gas can mean for the electrical construction industry. The Energy Forum will wrap up just in time for the finalists’ presentations for NECA Green Energy Challenge, the annual NECA Student Chapter design competition. Also remember that energy solutions education at NECA 2013 Washington DC doesn’t stop with the Energy Forum and continue with management education and technical workshops. Register today! “Inspiring Leadership” at the 2013 Women In NECA Roundtable will focus on leadership opportunities and strategies for industry women now and in the future. If you’re a woman involved within the electrical contracting industry, WIN wants you to join us for this once-a-year event! The aim of “Inspiring Leadership” is for women to see that there is a rewarding place for them in electrical contracting and NECA, and they don’t have to change who they are to achieve it. They simply have to be true to their best self. The basics of how NECA members move through leadership roles on the chapter and national level and the “gender-blind” characteristics that can help you serve as a NECA leader. Carolyn Fazio, Chair & Chief Executive, Fazio International Ltd.
How women are shaping the business of electrical construction and inspiring students to consider careers in electrical construction. Women in construction have unique strengths suited to help them excel in both management and leadership roles. We will explain how leadership and management differ, what effective leadership looks like, how to lead with greater success, and the benefits of great leadership to your career. A joint reception with NECA Business Development and Future Leaders will be held immediately after the WIN Roundtable. About Women In NECA: WIN supports the professional development of women working in the electrical contracting industry through educational and networking events; promotes diversity in the industry; and encourages women to explore careers in the electrical contracting industry. WIN works to make NECA and our industry stronger by advancing women’s goals for professional growth. We’re pleased to announce the addition of a management workshop on cogeneration energy to the Tuesday, Oct. 15 course schedule. Business Development Opportunities through “Behind the Meter” Cogeneration Projects: A Case Study Presentation will highlight the business opportunities that opened up for both the project owner and electrical contractor. Fort Hays State University went live in 2013 with a 4 MW Renewable Cogeneration system that produces up to 40 percent of their net electricity load. The project was designed to improve the campus’s bottom line by using of one fuel source to simultaneously produce both electricity and heat. The university’s Akers Energy Center operation includes two 900 kw peak-shaving generation units, 4160vac distribution system and the Staefa digital control system used in over 95 percent of the university buildings. The power plant generates steam to heat campus buildings and serves as a distribution center for electrical service to the university. The project owner, Fort Hays State University, and the owner’s representative will present the case study of how the business case was developed, sold, and implemented. During this case study presentation, best practices will be outlined for NECA contractors to replicate and generate incremental revenue through similar “behind the meter” projects. Tim Speno is President of E2E Summit™. E2E Summit ™ are industry specific, Executive- to-Executive meetings and peer groups, that connect industry Visionaries, Innovators, and Pioneers (VIPs). The purpose of these executive connections is for the VIPs to engage one another and to execute innovative programs that address the most critical opportunities affecting their organizations and their industry. Tim began his career with the DeWALT Industrial Tool Division of Black & Decker and for over seven years held various management positions in sales, product development, and manufacturing. From 2004 to 2006 Tim joined Cooper Industries, Bussmann Division, where he was involved in Product Management and New Business Development. In 2007, Tim joined the Executive Management Team of Milwaukee Electric Tool Corporation. For six years he was Vice President of Service and Demand Creation with an emphasis in Strategic Planning, New Product Development, Project Leadership, and Executive Management. Mike Steinke is an Executive Managing Partner of WECC LLC and directly responsible for sales and project development. He has personally acted as a wind business consultant on 300 plus projects ranging from 50kW “behind the meter” projects to large wind farms. He is qualified as an expert witness in the litigation involving wind farms, acted as a guest instructor in Wind technology at Autry Technical Center (Enid, OK). Mike has testified before the Oklahoma legislature on wind energy issues, made numerous renewable energy presentations at Energy Industry Conferences, Universities, and routinely speaks to community groups through the West. He has also assisted the Oklahoma legislature in crafting “ wind friendly” legislation and is published in a variety of journals and newspapers regarding the wind industry. Michael Martin is an Assistant Professor of Management and Marketing at Fort Hays State University. Mr. Martin recently completed his doctoral dissertation on service quality in Industrial Products return and repair process through Capella University. He received his MBA from Fort Hays State University after graduating with a BS in Marketing from Kansas State University. Previous to his arrival at Fort Hays State University, Mr. Martin delivered training programs to store level employees and managers in inventory control and customer service for Checkpoint Systems. His current research interests include customer service in manufacturing and student engagement in higher education. He has presented at the Southwest Business Symposium and published in the Journal of Business: Research, Teaching, and Practice and Southwest Business Administration Journal. 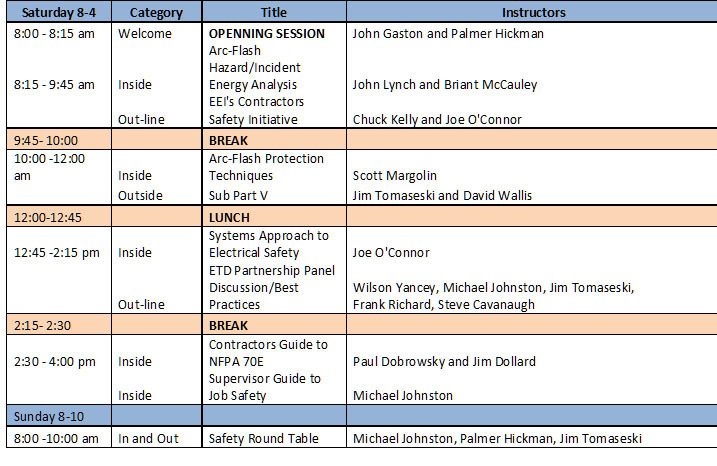 Here’s the finalized schedule for both the inside and outside sessions at the 2013 Safety Forum on Saturday, Oct. 12 and Sunday, Oct. 13 at NECA 2013 Washington D.C. The Safety Forum kicks off with pre-convention workshops of Friday and Saturday, including the popular OSHA 10-Hour Course, led by James McGowan, Director, Safety Training for Quanta Services Inc, and chairman of the training task team (Task Team II) for the OSHA Electrical Transmission & Distribution (ET&D) Partnership. He helped develop the ET&D Partnership 10-Hour OSHA course and the ET&D Partnership Supervisory Leadership Skills Outreach Training course and is excited to bring this course to this year’s Safety Forum. Sunday sessions at the Safety Forum will follow inside and outside tracks. Check out the table below to find the courses that will help you be a safety super-hero! Throughout the year, I meet and speak with numerous folks around the country, ranging from clients and prospective clients to industry analysts. With each conversation, I learn more about the industry, get new ideas for our construction software, and understand new challenges facing contractors. However, I find I learn the most during trade shows like the NECA Show because there are so many diverse companies and individuals congregated in one place at one time. From my experience, I’m not the only one who uses events like NECA to discover new trends, technologies, and industry news. At a trade show last year I spoke with a controller who had switched companies and was now looking at new construction management software for his current company. Even though he had been part of a software buying decision at his previous company, he commented how much had changed over the years, and how much he was learning about the latest technology. The number of ways to exchange and learn information has been growing dramatically in recent years – online seminars, electronic newsletters, LinkedIn groups, blogs, and so on. But they do not deliver what the trade show delivers – personal connection. There’s no disputing that online media provides valuable tools, but I firmly believe that personal connections provide more and better information because those involved are engaged in the conversation. Responses are more than just a quick reply to a forum thread or a comment on a news article. People enter into dialogs with passion, feeling, and unscripted exchanges. And when it comes to understanding industry challenges, there can be quite a bit of feeling involved. Similarly, construction software providers and other vendors at trade shows are passionate about their products and services. Everyone wants to tell their story, and trade shows provide the perfect place to do so. This is not to say that new technologies do not provide a good medium for sharing information. I think we can all agree that because of new technology, more connections are being made and more information is being shared. But to me, really engaging someone means establishing a personal connection, and that means meeting them, talking to them, listening to their stories, and understanding what a day in their life is like. These connections help me give feedback to our product management team, which helps with developing new products and setting the direction for our company’s software. When I’m at a trade show or other live in-person event, I can do this with many folks in one place at one time. I can get immersed in their world, which helps me serve them better when I return to my desk. So I hope that you’ll take some time to visit the vendors at this year’s NECA Convention – tell us about your challenges and learn about the solutions available to help you. >>Got something to share with John or his company? Feel free to use the comments below to ask questions or let him know what you’d like Dexter + Chaney to discuss at the NECA Show, Oct. 12-15 in Washington, D.C.
John Chaney is the President and Co-Founder of Seattle-based construction software provider Dexter + Chaney. He can be reached at jchaney@dexterchaney.com, and more information on the company can be found at www.dexterchaney.com. Dexter + Chaney will display its Spectrum® Construction Software at NECA Show 2013 (booth #555). Media outlets are promoting opportunities available from electrical apprenticeship programs. For the electrical construction industry, as National Electrical Contractors Association members know firsthand, building and maintaining a skilled workforce must include apprenticeship. ELECTRICAL CONTRACTOR Announces 2016 Showstoppers!